Bolt Action: Campaign: Battle of France is the latest supplement to the award-winning World War II wargames rules, giving players the opportunity to take command of the bitter fighting or france, from Fall Gelb and the British withdrawal from Dunkirk to the decisive Fall Rot. In this blog, we delve into Osprey Publishing's Men At Arms series to give you some great reference points for painting French, German, British, and Italian troops for this period. (1): Chef de bataillon, 92e RI, field dress, 1939-40. 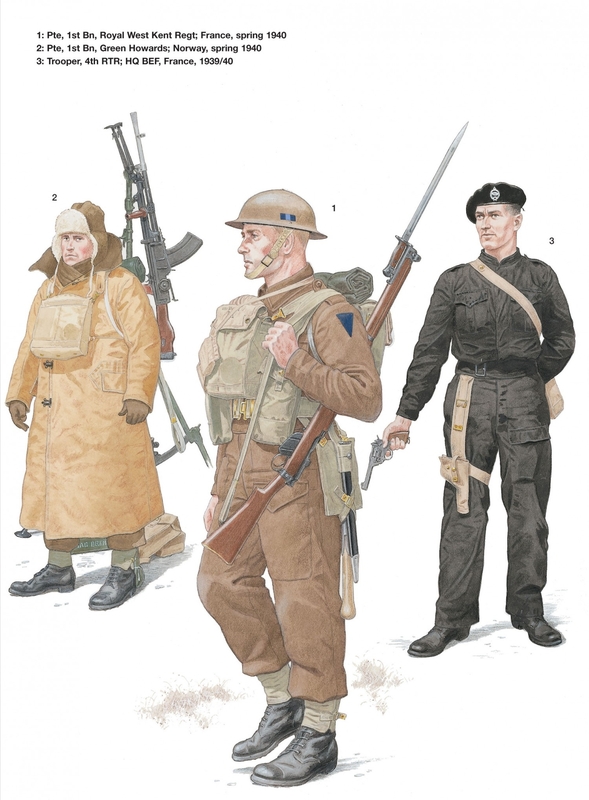 From January 1933 officers could combine the elements of their khaki uniforms in three different orders of dress: the smartest, day-time dress (tenue de jour – tenue no.3); working dress (tenue de travail – tenue no.4) and campaign dress (tenue de campagne – tenue no.5). The general rule was that officers should wear the same order of dress as their men. This meant that field dress included, whatever the season, a six-button 1932-pattern manteau worn over the vareuse. The manteau was supposed to be identical to that of mounted troops: in practice, however, officers’ collars were much more pointed, and the coat often included shoulder straps (as here). On khaki uniforms, rank badges were in 40mm long strips of braid, and decorations were worn as ribbons only. The 1918-pattern bonnet de police should have carried rank badges only, but officers’ caps were quite frequently decorated with dark khaki piping, and, more rarely, bore a circular cloth badge modelled on the collar patch. The fore-and-aft points of officers’ caps were often more rounded than those of the men. Officers’ leather equipment was made in a dark tan shade. Here, this man is wearing the 1918-pattern waistbelt with shoulder strap (inspired by the Sam Browne), an 1876/93-pattern holster, leather gloves, 1920-pattern leggings and 1919-pattern officers’ boots. He is carrying a map case and an ANP31 gas mask. In the field, a stick often replaced the sabre as a mark of command. First formed during the Great War, groupes francs or corps francs (an early version of commandos) were small units, generally of platoon strength (30 to 40 men), composed of volunteers from their parent unit. When on patrol or when raiding, these men wore a reduced order, at first based around regulation items. However, from spring 1940, units began to receive the 1938-pattern cotton twill uniform, worn over the jersey and the uniform trousers. The new uniform consisted of a veste-bourgeron with five painted iron buttons, and a pair of pantalon-salopettes – a simplified version, in a lighter cloth, of the items of dress issued to motorised troops in 1935. Originally, this uniform was intended to replace the old working dress of unbleached or blue canvas, and to provide a cheap uniform for local defence units for wear over their civilian clothes. It soon became apparent, however, that this uniform was suitable for patrolling in no man’s land. It was also distributed to the men of the CEFS in Norway, particularly to the Legion. The helmet is under a cover, and the man wears a blue star on his upper left sleeve – both typical features of the dress of groupes francs. His pouches are 1916-pattern, and he is carrying OF and F1 grenades and the FM24/29 spare magazine haversack: the ANP31 gas mask has been left behind as a useless encumbrance. He is armed with the 1892 M16 carbine, and wears 1917-pattern boots. This chasseur de 1re classe of the 2e BCP proudly wears the campaign uniform for BCPs and BCAs, as laid down in April 1935, for an inspection: his peacetime blues are partly hidden by his 1920-pattern capote with its unpolished dark khaki buttons, drawn from reserve magazines. The 1926-pattern helmet is khaki, as is the cloth which covers the water-bottle (out of sight on his right hip). In the chasseurs, the 1935-pattern shirt was dark blue with a black tie; the trousers are ‘dark iron grey’ (a colour made up of 95% dark blue and 5% unbleached wool) without any piping, as laid down in regulations, and the puttees, introduced in March 1936, are dark blue. Apart from the branch distinctions – the blue colour of some items, the helmet badge and the collar patches – the uniform is identical to that of the line infantry. This man wears the new 1935-pattern equipment. The first sets issued were recognisable by the soft leather cartridge pouches with a narrow flap and long straps, introduced in 1936. These were not very practical, however, rapidly losing their shape, and were quickly replaced by the 1937-pattern, first issued in 1939 (see Plate C1). The rifle is the 1907/15 M16; the boots are the 1917-pattern. Click here to order a copy of Men-at-Arms 315: The French Army 1939 - 45 (1). (1): Major, Panzerregiment 25, field uniform, Cambrai, France, May 1940. This battalion commander wears the M1935 tank crew uniform and M1938 officers’ feldgrau field cap, his feldgrau slip-on shoulder straps concealing his regimental number but not his rank. He carries the P08 Luger pistol in a hardshell holster, and 10 x 50 ‘short design’ binoculars. His awards are the aluminium Tank Combat Badge on his left breast, and the 1939 Iron Cross 2nd Class ribbon from his first button-hole. He carries a tank-commander’s headset with rubber earcups. His regiment fought in Belgium and France with 7 Panzerdivision. (2): Panzerschütze, Panzeraufklärungsabteilung 5, field uniform, Aisne, France, May 1940. 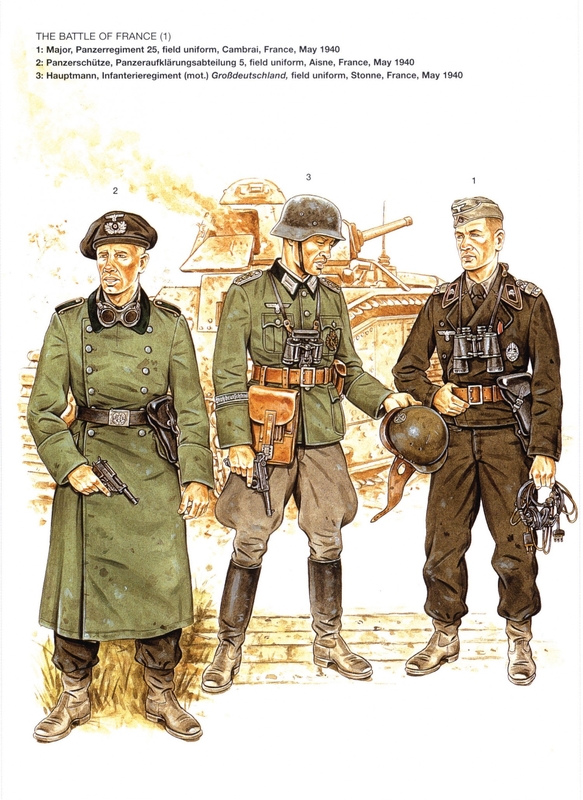 AFV-crews often wore their feldgrau field greatcoats to protect their black uniforms from dirt and grease, even though black was intended to disguise such soiling. This armoured-car driver wears the unpopular padded beret, a Walther P38 pistol in a hardshell holster and general purpose goggles. This battalion fought in Poland, Luxembourg and France with 2 Panzerdivision. The regiment, which fought under direct OKH command in Poland, Luxembourg and at Dunkirk, was the first army unit with an élite unit cuff-band and shoulder-board monogram, which was retained in battle. This battalion commander, examining a discarded French M1935 tank-crew protective helmet, has removed the national shield from his helmet. He wears the Infantry Assault Badge in bronze for motorised infantry on his left breast-pocket, carries the M35 map-case with modified fastener, a P08 Luger in a hardshell holster, and 6 x 30 standard binoculars. Click here to order a copy of Men-at-Arms 311: The German Army 1939-45 (1). (1): Private, 1st Bn, Royal West Kent Regiment; France, spring 1940. 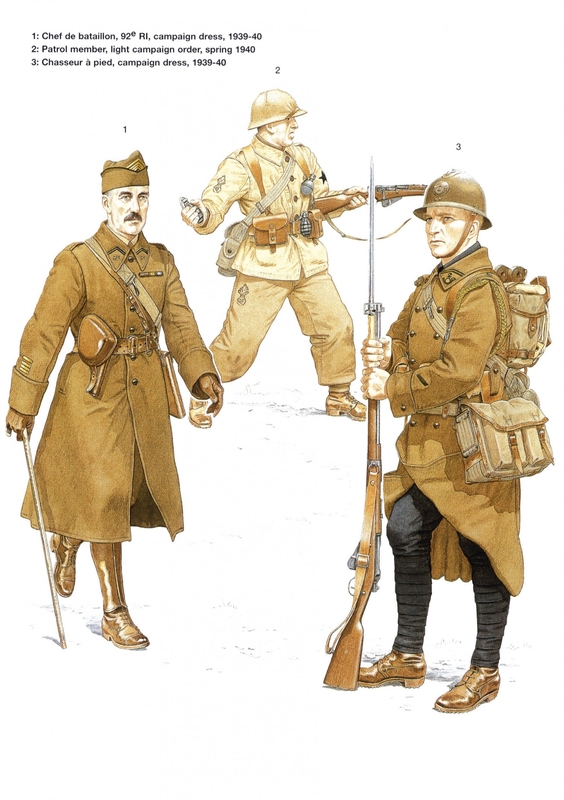 Initial issues of the new Battledress were given, as priority, to the BEF before its departure to France, although a small number of BEF service troops still wore the SD uniform. This Regular of the 1st Royal West Kents wears the new Battledress, Serge. The inverted dark blue triangle on both sleeves and the dark blue/light blue/dark blue helmet flash are one example of only very few unit insignia to be worn in the BEF, most BD being bare of anything other than rank badges. The 1937 equipment is finished with the lighter green shade of ‘blanco’ (No. 97 Khaki Green – No. 3 was darker); the anti-gas respirator is worn in the alert position on the chest; the anti-gas cape is rolled and placed on top of the small pack; and a 50-round bandolier of .303in ammunition is worn slung. Note the 1939 pattern entrenching tool. The helmet is the Mk I*, which was gradually being replaced by the Mk II. Typical for the period, the rifle is the SMLE Mk III*. The 1st Royal West Kents fought in France with 10th Bde, 4th Div; the battalion were later to serve with 12th Bde of that division in North Africa, Italy and, finally, Greece. (2): Private, 1st Bn, Green Howards; Norway, 1940. Troops embarking for Norway were issued ‘Coats, Sheepskin’, rubber boots, white naval-type heavy wool jerseys and sheepskin caps, as well as lightweight snow camouflage: in mid-April Norway was still bitterly cold and the landscape snowbound. This Bren ‘No.1’ observes the skies over Otta, alert to the return of German dive-bombers fronting the enemy’s push north from Oslo (Otta was to be awarded to the Green Howards as a battle honour for a brief but spirited action on 28 April). The sheepskin coat was bulky and cumbersome; unsuited to mobile activities, it was nevertheless welcomed by those on static duties. The ‘tripod, ground’ issued with the Mk I Bren doubled up as an anti-aircraft mount, using a front leg extension normally stored inside the main tripod, which was added to the mounting pivot using a ‘bayonet’ catch; in emergencies an SMLE rifle could be used instead of the leg extension, fixed to the tripod using the bayonet boss. In the AA role the carrying handle was normally turned out at right angles to the barrel and the bipod swung forward. This battalion was only in Norway for a few weeks as part of 15th Inf Bde, NWEF. As part of 5th Inf Div – the most travelled British formation of the whole war – the brigade would later see service in France, Madagascar, India, Iraq, Persia, Syria, Egypt, Sicily, and for many hard months in Italy. (3): Trooper, 4th Royal Tank Regiment; HQ BEF, France, 1939. The SD uniform that had fulfilled the needs of the British Tommy for both field and ceremonial duties fell far short of what was required by armoured troops. The two-piece Royal Tank Corps black working dress was introduced in 1935; of a very similar design to the BD uniform that was eventually to replace it, it was only issued to armoured vehicle crews. In November 1939 this regiment – stationed near Arras, and equipped with the flimsy little machine gun-armed Matilda Mk I – had yet to receive the new BD; this trooper wears the 1935 uniform, with a first pattern (long strap) tanker’s holster, identified by its lack of cartridge loops, for his .38in Webley Revolver No.1 Mk VI. The long, easily-snagged thigh strap of the holster proved a life-threatening hazard during emergency evacuation of an AFV, and was eventually removed to provide a belt holster. The 4th Royal Tanks, reinforced at the last moment by 7th RTR to form 1st Army Tank Bde, fought heroically against great odds in spring 1940. The regiment was later captured at Tobruk in June 1942 while operating Valentine tanks with 32nd Tank Bde in support of the South African garrison. Click here to order a copy of Men-at-Arms 354: The British Army 1939-45 (1). (1): Gunner, 59th Artillery Regiment, ‘Cagliari’ Infantry Division. A member of the crew for a 75mm field gun, he wears the Model 1933 steel helmet with the black stencilled artillery branch badge on the front. Underneath this he wears his bustina in lieu of a woollen cap; when used in this way the bustina soon wore out and could not be worn for its intended purpose. His M1937 jacket has a black-faced collar piped in yellow for the artillery, and bearing his division’s identifying patches – red with white stripes, and the national silver star. The black leather gaiters and grey-green leather bandolier were worn by a variety of mounted units as well as the artillery. (2): Caporale, 89th Infantry Regiment, ‘Cosseria’ Infantry Division. 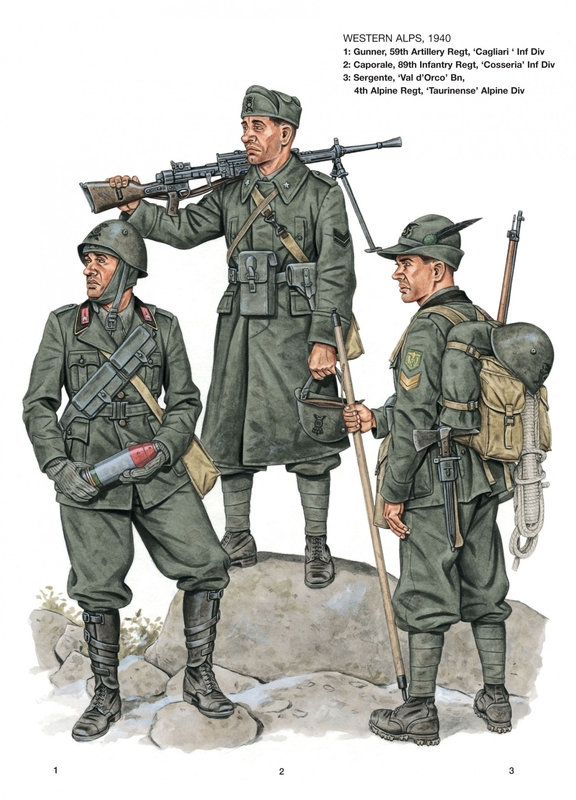 Like nearly all Italian troops fighting in this campaign the corporal still wears the M1937 uniform underneath his M1934 greatcoat. The greatcoat, worn throughout the war and even in Russia, lacked warmth because it was single-breasted. His cap is the popular bustina, and he is holding the M1933 helmet, both with infantry branch badges. His light machine gun is the 6.5mm Breda M1930; a poor design, chronically prone to feed problems in the field due to a dirt-attracting cartridge lubrication system, it nevertheless had to serve the Italian Army throughout the war. (3): Sergente, ‘Val d’Orco’ Battalion, 4th Alpine Regiment, ‘Taurinense’ Alpine Division. The ‘Taurinense’ was one of several Alpine divisions deployed in this campaign in the mountainous border region between France and Italy. This NCO wears the M1937 uniform; his felt Alpini hat has the green pom-pon of a 3rd Battalion attached to the feather-holder on the left side. On the left sleeve above his rank chevrons he wears the divisional arm shield which although being phased out was still worn at this time. The special equipment used by these mountain troops includes a M1939 mountain rucksack and climbing rope and a M1934 alpenstock. His rifle is the standard M1891 6.5mm Carcano used by most Italian soldiers during the war. Order a copy of Men-at-Arms 340: The Italian Army 1940-45 (1) from the Osprey webstore. Bolt Action: Campaign: Battle of France is publishing on 29th November 2018. Order your copy today! Looking at those color plates reminds me how much I miss Mike Chappell and Stephen Andrew.